I walk into a room where there’s a work of art on the floor. It looks like a satellite photo of landscape, filled with undulating browns. I bend down to get a closer view. Like a lone homestead, there’s an Aida cloth square embroidered in black thread. It has the letters RD and WS. Someone has been here. I stand up and see a pattern of smaller patches. To capture it for later, I focus it on my phone camera. The screen is filled with the words, “Thank you.” For what? Eva Heiky Olga Abbinga was born in Australia to a Dutch father and Ukrainian mother. Despite the mixed background, Abbinga’s Ukrainian heritage played a major role in her life. As a child, she attended the Ukrainian Scouting camp in Sokil, hidden in the Otway Ranges on Wathaurong country. Though not so directly affected by her Dutch forebears, she discovered early that her ancestor Jacob van Loon, a cloth merchant, was painted by Rembrandt in The Sampling Officials of the Drapers’ Guild in 1662. Textiles also play an important role in her Ukrainian and Australian identity. The Ukrainian story in Australia was invested in textiles, ranging from the precious embroideries retained as heritage to the “make do” textiles of the refugee camps—pillowcases and rugs from potato sacks. As a young mother, her partner’s Australian family gave her handmade quilts for her children. An abiding concern for Abbinga is what it means to be a mixed heritage Australian Ukrainian. How can you connect such a mild suburban culture as Australia with the raw tragedy that seems to constitute modern Ukrainian history? In recent years, what is there in Australia that can reflect the upheavals of the Maidan and the ongoing civil war? How can we make visible the radical uprooting that lies underneath that tranquil surface? Abbinga first approached this subject with her performance work, The Well (2013-2014). The Well was commissioned for the 80th commemoration of the Holodomor—the ‘hunger-extermination’ of 1932-33, when the Ukraine was subject to a planned famine by the Soviet Union, leading to the deaths of 3-8 million people. During this time, the Soviet authorities planted a black flag in a village where all residents had died of starvation, as a signal to collect the bodies. Abbinga’s contemporary Australian response was to carry black flags in a procession from Fitzroy Gardens to Federation Square, then later to parade them from West Space Gallery to the State Parliament. The bearers were the Lehenda Dance Company dressed in traditional embroidered costumes. These black flags served a double purpose. On the one hand, they referenced a mournful symbol of the tragedy. And on the other, as abstract symbols with no precedent in Australia, the flag carrying evoked the absence of any parallel reference here. It appeared like a virtual commemoration, signifying a less known tragedy here. The current project came out of the idea of sewing the flags in The Well together. Abbinga discovered the Rajah Quilt when it surfaced in the exhibition Quilts: 1700-1945 at the Queensland Art Gallery. This story offered her a parallel to the Ukrainian story in a language of textiles that could be translated between the two cultures. As with The Well project, the challenge was to find a way of bringing this to life again in contemporary Australia. The Rajah Quilt was named after the ship used to transport 180 female convicts from England to Tasmania in 1841. These women had each been given a kit for them to work on a common piece for the duration of their journey. The scheme was developed by Elizabeth Fry, a Quaker who formed British Ladies Society for the Reformation of Female Prisoners. Fry believed that reform was possible through a pastoral model that emphasised education and kindness. Needlework, in particular, was seen to offer a means of contemplation, through which individuals might find their “inner light”. The labour-intensive nature of patchwork was well suited to those with much time on their hands. The women prisoners were under the charge of Miss Keiza Hayter, who had worked at Millbank Penitentiary and was offered free passage in return for managing the patchwork program and on arrival to assist Lady Franklin in the formation of Tasmanian Ladies’ Society for the Reformation of Female Prisoners. Women were supplied with 10 yards of fabric, 4 balls of white thread and a ball each of black, red and blue thread, black wool, 24 hanks of coloured thread, a thimble, 100 needles, threads, pins, scissors and 2 pounds of patchwork pieces. The result of their labour is a 325 x 337cm coverlet which consisted of a square centre in the style of Broderie Perse (appliquéd chintz), surrounded by twelve frames radiating outwards. The chintz was fashionable at the time and one can imagine it represented a middle-class culture normally beyond the reach of the women. The result of their 14 weeks of labour is a handsome quilt that stands both as a testimony of labour and work of art in its own right. Bloodstains can be found, probably where needles pricked the skin. The ratio of 1 thimble to 100 needles was not particularly kind. kind admonition of being industrious. These words turn the quilt into an elaborate receipt, to be returned to Britain as testimony to the benefits of this project. Unfortunately, Lady Franklin took a different attitude to reform, based on discipline and punishment, and did not welcome the quilt. Known today as the Rajah Quilt, it is the most frequently requested object for viewing in the National Gallery of Australia. Apart from touring, it is normally made available for viewing only once a year. Abbinga’s contemporary version of the Rajah Quilt re-grounds it in the here and now. This work was distributed through different communities—Ukrainian Scouts, the Geelong Quilters Guild, the Geelong Embroidery Guild and public through social media. For Arrival of the Rajah, Abbinga produced 36 separate quilts, each of which contained three layers of fabric. Twenty pieces were 1200cm square and sixteen were curved, producing an overall circular shape. 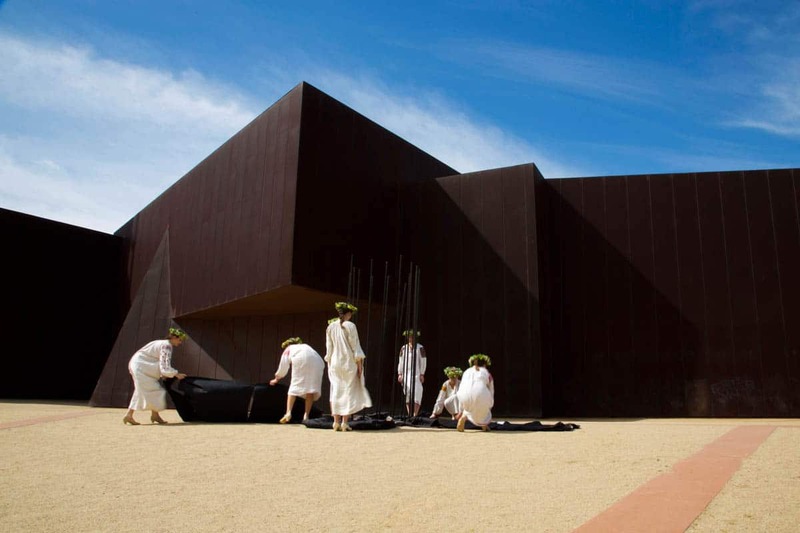 The fabric was coloured with a variety of dyes including materials collected around Geelong—leaves, reeds and rods from street cleaners. Kits were distributed to quilters with instructions to ornament the textile with reference to their own identity and the history of Rajah Quilt. Each design was dedicated to an individual female convict. So seventy Aida cloth patches were distributed to the Ukrainian community and social media for embroidering. These include five QR codes linked to tattoos recorded as being on the bodies of the original quilters. All the pieces fit together into a circle which is laid on the floor. At the centre of this are sixteen burnt dowel rods. Those familiar with Abbinga’s work may think that the blackness of the flags in The Well has migrated to the flag poles themselves. 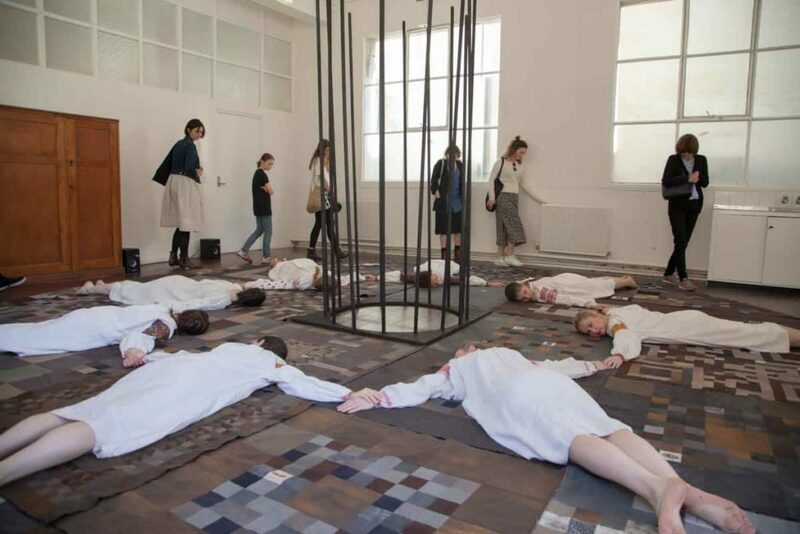 The quilt is activated by performers who each lie face down on the quilts and walk around the work. It was first activated on the lawn of Geelong Customs House in a performance lasting four hours, followed by another performance at the annual Ukrainian scouts camp in Sokil. The social structure underpinning the original Rajah Quilt was the colonial penitentiary system, realised in the role played by Lady Franklin. For the contemporary Rajah, Abbinga has substituted a commemorative ritual that evokes the shadow cast by settlement. The black poles can seem both to refer to pre-contact forms of agriculture by fire and the devastation of the land and people that European invasion wreaked. The closed ranks of the poles provide a contrast to the open expanse of quilts. Quilts have had a contentious status in the world of art. As products of domestic labour, often consisting of textile scraps used as patches, quilts occupied a lowly status. They were seen as folk craft, by contrast with original works of art in paint on canvas. In modern art, this was challenged by the exhibition of quilts from Gee’s Bend, Alabama. These came to being originally as make-do textiles that attempted to compensate for unheated shacks occupied by descendants of slaves. They were “discovered” as abstract works of art during exhibition Abstract Design in American Quilts at the Whitney Museum (1971, and then in 2002 as a solo show). Though providing a popular vernacular dimension to the realm of abstraction, this did not lead to individual quiltmakers becoming artists in the conventional sense. Nevertheless, it was useful in stimulating a market for their works which continues today. The visual arts dimension of Abbinga’s work is more in the form of a platform than as individual art works to be contemplated in isolation. The modern history of quilts is in part the history of political movements. The Quilts of the Underground Railroad were an alleged series of bedspreads that had information sewn into them to help slaves escaping from the southern states of the USA find freedom in the north (see the novel Cion by South African author Zakes Mda). That there is no evidence for such quilts is a testimony of their imaginary power as platforms for solidarity. It is particularly the collective nature of quilt-making that largely contains their political power. In the late nineteenth-century, funds were raised for the Australian missionaries caught up in the Kuching Massacre in China by selling 50 spaces on a quilt on which the donors names would be sewn. The Autograph Quilt was then sold at a church bazaar in Coburg, Melbourne. The potential for the quilt to contain secret messages was used by women imprisoned in Changi, Singapore, during the Second World War, who embroidered symbols that informed male prisoners of their presence. This event inspired Abbinga to include QR codes. This political role of quilts was brought into prominence particularly in 1985, when Cleve Jones conceived of the NAME Project AIDS Memorial Quilt as a means of giving visibility to this largely hidden catastrophe. It was determined to have individual panels the size of a human grave—3 x 6 foot. The response was overwhelming. There are currently 48,000 individual memorial panels representing over 94,000 people. This method was used again in the aftermath of the September 11 terrorist attack on New York. Beyond memorialisation, quilts can also reflect on contemporary issues. Kathryn Clark has made a series of Foreclosure Quilts that represent the recent history of evictions that beset USA in the wake of the 2008 financial crisis. Clark shares with Abbinga a background in urban planning. The resemblance of patches to blocks of land was used by her to represent the pattern of lost homes. For Clark, quilts carry an interest in the lives of humble people: their association with shelter make the depiction of homelessness particularly poignant. Around the same time, the US artist Ginger Brooks Takahashi organised a series of quilting forums titled An Army of Lovers Cannot Fail. These used the spirit of the quilting bee to bring together people seeking to represent their marginal sexuality. These projects draw on the popular craftivist movements involved in actions like yarn-bombing which developed in the USA and have spread to Australia. In Australia, there is an alternative trajectory in the visual arts that can be found in the performance work of Tom Nicholson. Nicholson’s project Proposition for a Banner March entailed the creation of textile banners that featured enigmatic pixelated faces. These evoked both the history of Trade Union banners and the formal nature of propaganda posters. Nicholson mapped processions for the parade of the banners through the streets of Australian towns. Though his work could be read as a critique of the emptiness of contemporary politics, the collective activation in marches traces at least a nominal form of solidarity. This resonates strongly with the black flags and poles used by Abbinga, though her form of collectivity re-connects a trajectory back to the beginnings of settlement. The twenty-first century is a time to also think beyond the colonial context of the Rajah Quilt, particularly given the Indian origins of its name. The Australian duo Caravana worked in Pakistan with women under purdah, providing embroidery as a means of self-expression. They provided digital cameras and conducted storytelling workshops to help foster expressiveness. The embroidery form suited their sequestered lifestyle and offered something of tangible value (the works were sold and the artists achieved good publicity). This is a rare example of the international language of embroidery. Other solo Indian artists like Shelly Jyoti use quilts as a means of reflecting the material culture of India incorporating historical fabric into works reflect major historical events such as the Great Salt March. Abbinga’s work is critically important in re-imagining of the quilt as a collective space in the visual arts. This involves a displacement from the domestic sphere to the public space of the art gallery, where it can share stories with strangers. But it still retains the connection to everyday life. Unlike a precious painted canvas, the quilt can be thrown around for different uses (many have already slept under the quilts in this exhibition). And the versatility of the needle allows participants to work on the quilt in their own homes. Beyond the formal issues, this quilt has something important to say about non-indigenous Australia. Abbinga’s Rajah quilt has a parallel with the Victorian Aboriginal practice of the possum-skin cloak. In the late twentieth-century, Aboriginal leaders and artists revived this tradition for special events, such as the Commonwealth Games. Janet McGaw proposes that these cloaks function as maps, as different communities have been responsible for inscribing separate pieces with their own designs. Abbinga connects us to a story of settlement that involves the kind of struggle we associate with displaced peoples. The unglamorous lives of these female convicts were shaped by the English class system, that forced them into petty crime, which earned them transportation to the other side of the world. Beyond the glories of the British empire, non-indigenous Australians are searching for an alternative story of origins, which reflects a kind of struggle that lends itself to solidarity with those original inhabitants, swept aside by colonisation. A key part of the process has been sharing this story with the local indigenous communities around Geelong, the Wathaurong people. Abbinga presented the story to the Wathaurong Art Group, who reciprocated with a Welcome to Country in the Geelong event and the Next Wave exhibition. “Thank you” for who and for what? 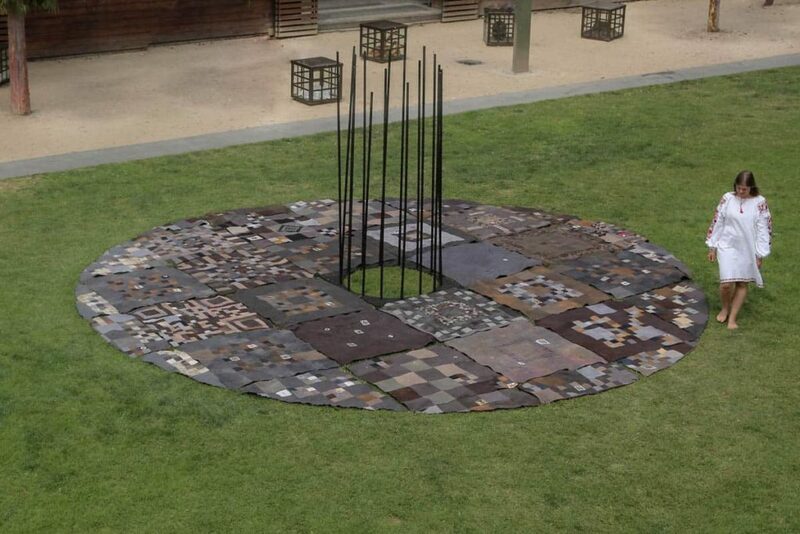 I’ve since learnt that “Thank you” was, for Abbinga, partly a response to the Aboriginal artist Bindy Cole’s reconciliation work, We all need forgiveness for the Sydney Biennale (2014), in which a video grid of Aboriginal voices said, “I forgive you”. It was also recognition of the collective nature of the work, including the original convict quilters, the groups who contributed their needlework today, and we who bear witness in our own lives to this ongoing testament of settler history. The Arrival of the Rajah is a receipt, but to a different bearer. The original Rajah Quilt was addressed to representatives of empire. Today, Abbinga’s quilt arrives back in the land that was taken. It acknowledges the exclusion at the heart of settlement, while sewing new roots into the land. For that, we can offer thanks. Eva Abbinga’s Arrival of the Rajah was exhibited at the Abbotsford Convent Melbourne as part of the New Wave Festival in May 2016. Her current project Crownings is in collaboration with Larissa Linnell.